Joe Buck (Jon Voight) is a picture perfect Texan cowboy, from his black Stetson right down to his shiny, flamboyant boot tips. He may not be able to ride a horse but as he himself admits he’s one hell of a stud. And so, equipped with nothing more than a cow hide suitcase and a transistor radio he waves goodbye to his hometown of Big Spring and sets off for the Big Apple, accompanied by the optimistic hit theme song ‘Everybody’s Talkin’. 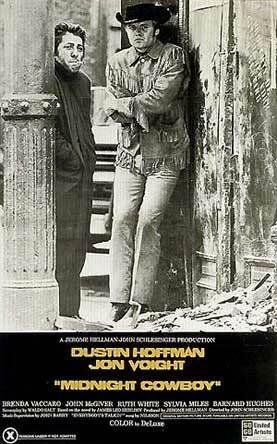 Joe’s plans revolve solely around hustling rich women for a living but his flash outfit doesn’t go down too well in the trendy, tailored city and he soon finds himself down on his luck, commiserating with a cripple called Ricco ‘Ratso’ Rizzo (Dustin Hoffman working magic in one of his most outstanding screen performances). Only after an initiation by fire does Joe realise that his newfound friend is actually a professional street conman. It’s yet another cruel lesson in urban living and after reconciling himself with it and with it’s perpetrator, he moves into Ricco’s squalid squat. They’re an odd couple, these two, and a fragile dependency develops between them that gradually evolves into true friendship. Ricco advises Joe to ditch his threads, pointing out that only “faggots” wear that kind of gear. Joe is horrified by this suggestion; John Wayne wasn’t gay. And besides, his clothes make him feel good. Only when they reach their Nirvana, in this case Florida, does he finally take his buddy’s advice. But by then it’s way too late, at least for Ricco. The film won the 1969 Best Picture Oscar as well as that year’s Best Screenplay award (for Waldo Salt who adapted it from the novel by James Leo Herlihy). John Schlesinger also won Best Director, which is rather surprising given the experimental nature of his work here, ranging from graphic flashbacks to projected images on naked bodies gallivanting at groovy art happenings. He also cuts away to footage of building’s collapsing to convey emotional breakdown and shows extravagant fantasy sequences of Ricco holding court around the pool in Florida when, in fact, he’s destitute in the street. Recent films like Mysterious Skin make the gay hustler action here seem very outdated but in its time Midnight Cowboy was as shocking and controversial as they came.